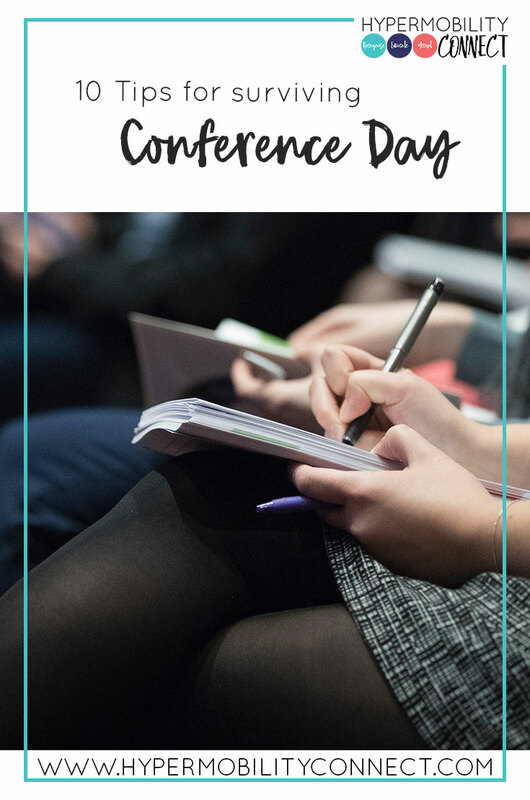 If you’re heading to the Ehlers-Danlos Society Learning Conference in Australia in December, here are my 10 tips for surviving conference day, from a seasoned conference attendee! The venue will be air-conditioned which for some people tends to wreak havoc with hydration. Remember your water bottle, and make sure you drink lots of water, and less tea/coffee to keep yourself hydrated throughout the day. While morning tea, lunch and afternoon tea are provided by the conference, if you’re a snacker, then please bring extra sensible food with you. Try to avoid things that other people are commonly allergic to, like peanuts. Bring enough food to get yourself through the day, as there are no guarantees that the food outlets on the campus will be open as semester will have finished. If you have intolerances etc., always go to events like this prepared for your food not to be “as ordered” and make sure you have enough food with you to get you through the day. I am one of those people who will be packing a boring gluten free, dairy free, meat free sandwich in my bag just in case they couldn’t cater for my dietary needs. I recommend you do the same or be prepared to go hungry! 3. Wear something comfortable – comfort over fashion! Conferences are not fashion parades. Wear something that you’re going to be comfortable sitting in for 8 hours. Also, remember to bring layers. Air-conditioned rooms can be so unpredictable, so even if it’s a hot day, bring a cardigan/jacket just in case they pump the aircon. Don’t forget to wear sensible shoes (if you walk) because you’re going to need them to be comfy walking to & from the carpark or public transport. 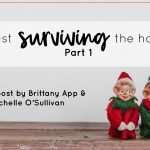 If you missed our post with all the details, check it out here! If you do find yourself getting overwhelmed, whether that’s while listening to presentations which hit on a sore spot, or in conversations with others in break time, don’t hesitate to remove yourself from the situation. If it’s during a presentation, you can get up and leave quietly. If it’s in a conversation with someone, you can politely excuse yourself and go and get some fresh air or make a bee-line for the bathroom. Don’t force yourself to endure situations which are overwhelming for you. The day is meant to be helpful, not harmful. The reason I include this point is because I remember my first conference (in the USA) and I was utterly overwhelmed by the number of people in wheelchairs, using crutches and other mobility aids. While it was nice to be in a room full of people who understood, it was also slightly terrifying. Always remember that everyone is on a different journey. They have come from a different place, and they are going to a different place too. What I mean by that is, everyone has had different treatment experiences up to this point. Some have had good management, others have had no or little management, and that can be a big predictor of where people are at and the trajectory of their condition. 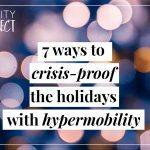 If you’re on the more mild end of the hypermobility spectrum, don’t assume that you’re going to end up like the people you see using wheelchairs, in neck braces, etc. That’s not everyone’s path. Just because you paid for the whole day doesn’t mean you have to attend every session or be switched on for every little thing presented. For people who aren’t used to being around groups of people, or with their brains switched to medical-mode for 8 hours a day, it’s probably going to be a challenge. Allow yourself to take time out if you need it. Listen to your body. I know a lot of people are excited about meeting other people who “understand” hypermobility & EDS. It’s an excellent opportunity to meet new people and to connect with people you have only ever talked to online, like our Hypermobility Connect Group. Make the most of the chance to talk to people, listen to their stories and share with them. Don’t try and write everything down or you will do yourself an injury! Absorb the knowledge. Listen and try to apply the info to your situation. Write down “take-home messages” and “ah-ha moments”. When you apply things to your own situation in the moment of hearing them, you’re more likely to retain the info! It’s going to be a long day, and the last thing you want to do is make it more uncomfortable or unmanageable for yourself by forgetting your medication if you normally take it. Come prepared. There will no doubt be things you hear that you don’t like – it ALWAYS happens at conferences. There will be things which are difficult to hear, usually around pain management and best practices. Some of the things said may cause you sadness, for the way things could have been, or should have been. Some points may cause distress, thinking about what might lie ahead. And some things might make you angry, that’s OK too. Try to have an open mind, don’t discount the ideas. Write it down, do some more research after the conference and see what you think then. Remember this is your journey. And most of all, enjoy the experience.